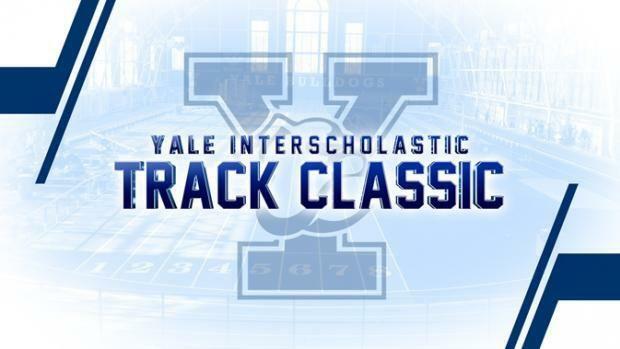 The Yale Track Classic will once again be live streamed on MileSplit with complete coverage on both Friday and Saturday inside the Coxe Cage. 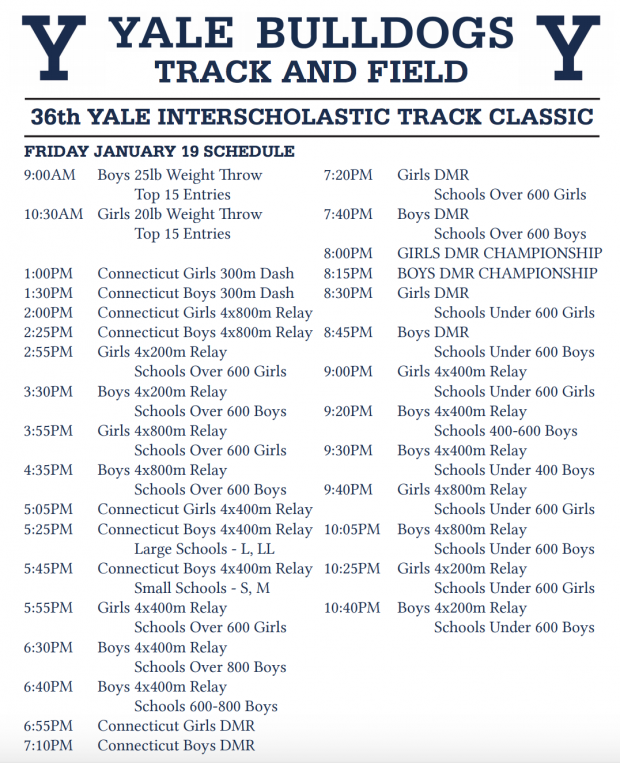 Who are some of our top Bay Staters who will be competing this weekend at Yale? Brockton will have squads in the championship 4x200m and 4x400m relays. In both relays, the Boxers rank among the top 10 statewide. Brockton's at No. 8 in the 4x200m (1:33.33) is No. 5 for the 4x400m (3:29.51). Norwell's Steven O'Driscoll is entered in the Championship Mile where he brings a best of 4:27.91 to the line. Last week, O'Driscoll was third for 800 meters (2:02.97) at the East Coast Invitational. He was also third in the event (2:03.76) at the Dartmouth Invitational. Marshfield's Mike Maglio, who ranks No. 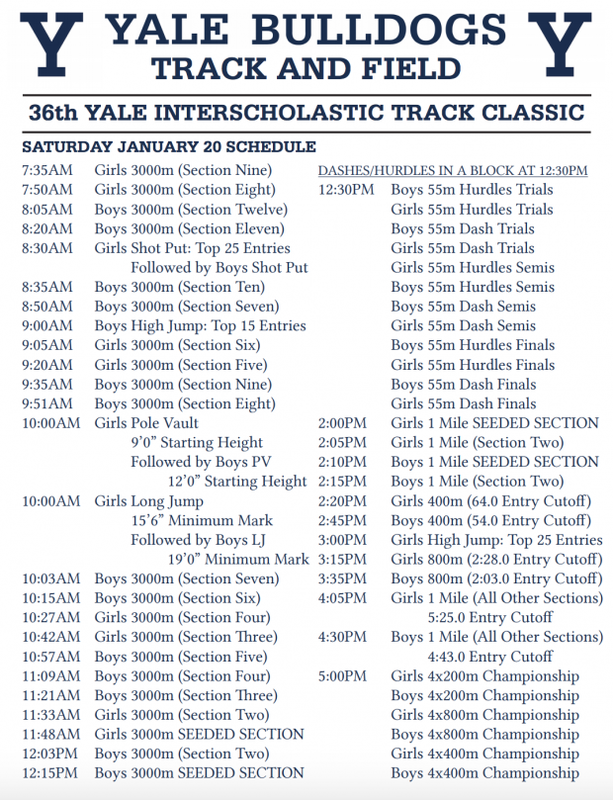 13 in the 1,000m (2:39.15) this year, will join teammates Joe Joyce, Nick Vallenti and James Condon in the mile. In the Championship 800m, Chelmsford's John Mieszczanski will try and contend with the best. He's gone sub-two for the two-lapper and currently is No. 3 for 1K with a best of 2:36.81. Alexina Hurley of Woburn will compete in the girls' Championship Mile. She ran an indoor PR of 5:14.74 at the Middlesex League meet on Jan. 9.